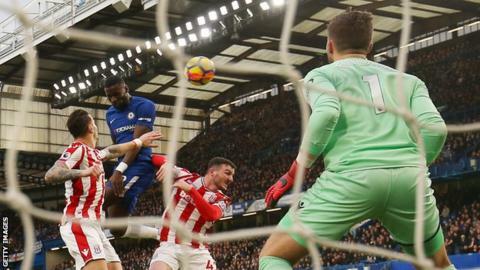 Reigning Premier League champions Chelsea kept up their superb recent form with an emphatic victory over struggling Stoke as Carlos Carvalhal made an immediate impact in his first game as boss of Swansea. Goals from Antonio Rudiger, Danny Drinkwater and Pedro gave Chelsea complete control within 23 minutes at Stamford Bridge, with Willian and Davide Zappacosta adding further goals in the second half to make it 26 points from the last available 33 for the Blues, who trail leaders Manchester City by 13 points. Antonio Conte's side moved up to second with the win, a position they held after Manchester United were held to a 0-0 home draw by Southampton in the evening kick-off. Swansea were trailing 1-0 at Watford until the 86th minute but goals from Jordan Ayew and Luciano Narsingh turned the game around to lift Calvalhal's new side off the bottom of the table. Mohamed Salah took his tally of Premier League goals for the season to 17 with a double as Liverpool came from behind to beat Leicester, who had led at Anfield through Jamie Vardy's early goal. The Reds remain fourth in the table, four points ahead of Tottenham and Arsenal in fifth and sixth. Ryan Fraser also scored twice, for Bournemouth, who inflicted a first defeat for Sam Allardyce as Everton manager. There were no goals for any of the side's promoted from the Championship last season as Huddersfield and Burnley finished goalless, as did Newcastle v Brighton. Who's on the move in the January window? Premier League festive fixtures: Which clubs have toughest schedule? In Scotland, Rangers held Celtic to a 0-0 draw in the Old Firm derby, but Brendan Rodgers' team remain unbeaten against their fierce rivals since 2012 and seven points above second-placed Aberdeen at the top of the Scottish Premiership table. Derby moved up to second in the Championship with a 2-1 victory at Ipswich. County are seven points behind leaders Wolves, who face third-placed Bristol City at 17:30 on Saturday. There were also big wins for two of the sides in the bottom three, with Birmingham beating Leeds 1-0 and Bolton claiming a victory by the same scoreline at Sheffield United. Who is on the move in January? Read more on Transfer gossip: Who's on the move in the January window? Who makes your 2017 Premier League XI? Read more on Premier League team of 2017: Who makes your best XI?